The following post is sponsored by AcaciaTV. For our sponsored post policy, click here. Two of the biggest reasons we hear people say that they struggle to get or stay fit is 1) they don’t have time to get to a gym and/or 2) they can’t afford to go to a gym or hire a trainer. And to that we (nicely) say phooey! Why? Because of AcaciaTV. You’re strong! And AcaciaTV can help you reach your fitness goals. For only $6.99 a month (that’s like, ahem, two lattes), you can do unlimited workouts on your computer, mobile or TV via Roku or Samsung Smart TV. 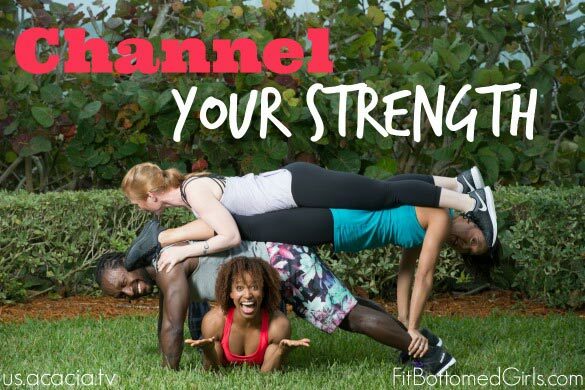 AcaciaTV is a subscription fitness streaming video site and one of our favorites because, like we said, it totally eliminates barriers to working out — and the workouts are awesome and for everyone. We’ve long been fans of the Acacia workout DVDs, and AcaciaTV is like having an unlimited supply of those DVDs — at your fingertips 24/7. (Which has been perfect for me, seeing that I’m now squeezing in workouts at all times of the day between feedings and baby snuggles.) The vibe of all of the programs is so darn FBG, too. The trainers are diverse and come in all shapes and sizes (hallelujah!). Not to mention that the programs are friendly, fun and can help everyone from total newbies to seasoned exercisers get their sweat on and see results. The variety of workouts offered is kind of ridic, too. We’re talking yoga, strength training, dance, barre, Pilates, abs and core, pregnancy, low-impact, therapeutic, cardio, tai chi, kettlebell … the list goes on and on. And the level of instruction is top-notch. So often online workouts pass over the important stuff and just focus on “feeling the burn,” when you really need an instructor who’s trained and knows how to give proper cues on form. The AcaciaTV trainers do that! Which, you know, means less injury and, again, better results. And for your $6.99 a month, you not only get all the workouts, but you also get support. There’s a private Facebook community for members only where you can get advice. AcaciaTV trainers and two experts contribute to the page daily so that you’re always learning and staying motivated, and there are two weekly challenges for members to keep things fresh. We seriously can’t recommend AcaciaTV enough. It’s convenient, fun, motivating, affordable … and it works. And, right now, AcaciaTV is offering a super special deal to FBG readers only: 25 percent off for a year! Just use the code ACACIAFBG when signing up here. Wow! I’ve been reading FBG stuff for years and now my picture is on your page!!! I am Coach Alison Heilig and the “Get Motivated” pic is me!! I’m the Fit Blogger for AcaciaTV and am honored to be pictured on this site!! Love you ladies! !